Carved by the Colorado River and its various tributaries over millions of years, the Grand Canyon is a vast mountain range with great depths and soaring heights. Out of our numerous adventure vacation packages we offer here at Austin Adventures, you must not miss our Grand Canyon vacation if you have the passion for thrilling adventure. Family adventure vacations are a perfect way to spend quality time with your family and truly revel in some heart pumping action. 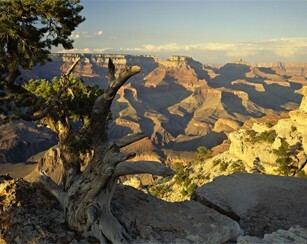 One of the Seven Wonders of the World, the Grand Canyon stands proudly over 277 miles of land. Mostly unknown to tourists is a hidden oasis of thundering waterfalls, serene lakes and hot springs. It’s a place called Havasupai, the most remote village of America. Hike the uneven rocky paths of the canyon – the only way to reach the base camp of the falls and your efforts of the day will prove to be worthwhile at very first sight. Cascading waterfalls falling into sparkling blue crystal clear water is nature’s way to give you well deserved relaxation. Play around and splash water on your partner and sleep camping under the clear night sky at the foot of a 100 ft. waterfall. Take a hiking tour in the Grand Canyon National Park and hike on the Bright Angel Trail and along the rims to catch the first glimpse of the roaring river below. Visit Navajo and Hopi trading posts, and shop for exquisite Native American jewelry and handicrafts. Stroll through the picturesque East rim and check out the Desert view lookout. Make the Grand Canyon your vacation destination this year by simply stopping by our website to view our travel destinations.